Now you are quite free to disagree with Doherty’s method and analysis. (I find myself parting company with him at times.) I have no doubt that when Doherty was actively engaged with these discussions he would have welcomed and appreciated such engagement. What we are not justified in doing is suppressing and denying Doherty’s argument thus far by merely insisting that “born of a woman” means Jesus came and died and was resurrected in the time of Pilate and that’s what Paul is saying here. What is justified is a critical engagement with the argument thus far presented. So now that we have understood Doherty’s case for the meaning of the passage as a whole, the next step is to return to look to see how “born of woman” and “born under the law” fit in. Does Doherty call out “Foul! Interpolation!” to justify his argument thus far? Will the meaning or analysis Doherty has discerned up till now need to change if we add those two phrases? Nor will this need to change if we include the phrases “born of woman, born under the Law” as authentic to the text. Doherty next states that this passage in Galatians is consistent with every other reference in Paul’s letters to the coming of Christ: in every case the sense is that God sends his son as a revelation in the time of the apostles such as himself. Doherty argues that for Paul that fullness of time was the time of his, Paul’s, preaching and the purchasing of believers to be free from the law through faith and the spirit. Paul can focus the fullness of time on himself and his own activity, something he would not have been able to do if he believed that the crucial moment of actual purchasing of believers or their liberation happened on the cross a generation earlier. Upon us the fulfillment of the ages has come! Again, one is free to disagree with or qualify Doherty’s interpretation. But this cannot be achieved by ignoring his interpretation and responding with nothing but one’s own “presuppositions and terminology” as if they have a right to be accepted by virtue of their conventional status. When did the power of the law come to an end? Surely most of us would assume that Christ’s death on the cross accomplished that. But Doherty asks us to notice something in the way Paul explains it. For Doherty, such a scenario best fits a crucifixion that happened at some unidentifiable time and place, a crucifixion that had long been hidden through the ages and was only now being revealed by God. Only with such a background it makes perfect sense that Paul would say, as he does, that the law held dominion until the time the son’s sacrifice was revealed and faith came. Similarly in 1 Corinthians 15:12-16 Paul seems to be saying that we believe in the resurrection by faith, not by historical witnesses. 12 But if it is preached that Christ has been raised from the dead, how can some of you say that there is no resurrection of the dead? 13 If there is no resurrection of the dead, then not even Christ has been raised. 14 And if Christ has not been raised, our preaching is useless and so is your faith. 15 More than that, we are then found to be false witnesses about God, for we have testified about God that he raised Christ from the dead. But he did not raise him if in fact the dead are not raised. 16 For if the dead are not raised, then Christ has not been raised either. In the later letters that appeared under Paul’s name the above teaching seems to have been modified, so that in Ephesians 2:15 and Colossians 2:14 we read that the death of Christ itself abolished the law. But even here, as Doherty points out, we have a mystical scenario where at the same time demonic powers are defeated by the son. What is the relevance of “born of woman, born under law”? At this point Doherty asks what relevance could our two phrases have to such a reading of Galatians 3-4. If Doherty’s analysis and interpretation of the thought flow of Galatians 3:19 to 4:7 is plausible then what does the note that Jesus was born of a woman and under the law contribute to the discussion? If it had been the death of Jesus that enabled the ultimate act of God to free people by hearing and believing the message, then what was the point of saying Jesus had been born of a woman or had been born under the law? Surely if he was a man crucified by human authorities in a recent past then that should have been the point for Paul to stress. “Born of a woman” adds nothing to the argument. Nor does “born under the law” have any relevance to the thought-flow of the passage. Yet Doherty has not yet begun to examine those two phrases. That comes next through engagement with a critical commentary that addresses the Greek text in detail. Getting rid of an inconvenient passage? We are not yet in a position to argue with the details of Doherty’s discussion of “born of a woman” because up until now we have been covering Doherty’s analysis of the theme and thought of the entire passage. One point should be clear by now, however. And that is, that Doherty’s argument for even suggesting the possibility of an interpolation is a consequence of, a result of, an outcome of attempting to grasp the flow of Paul’s thought in the broader context of what we know of his thought in other of the “genuine Pauline epistles”. The possibility of interpolation is clearly not a cheap gimmick, it is most certainly not an ad hoc excuse. Doherty’s argument about the primary message of Paul would not be affected if the phrases were found to be authentic. 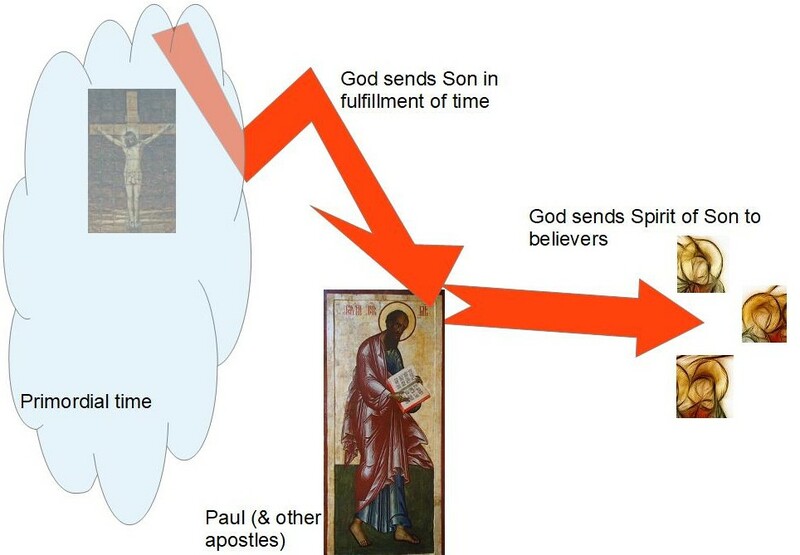 We will see that Doherty’s argument about Paul’s gospel message and its relationship to the “fulfillment of the ages” and its source in revelation and its message of the son coming in the form of spirit is not affected by those passages and remain valid even if they remain. If, on the other hand, as we shall see, the phrases a removed for reasons of greater simplicity and plausibility, then that might be somewhat more satisfying for some readers. If scholars are seriously wanting to undermine the arguments of Earl Doherty they need to address his primary arguments. Ignoring and in the process misrepresenting them has the potential for erode public confidence in mainstream biblical scholarship. Gathercole, Simon. 2018. “The Historical and Human Existence of Jesus in Paul’s Letters.” Journal for the Study of the Historical Jesus 16: 183–212. Doherty, Earl. 2009. Jesus: Neither God nor Man: The Case for a Mythical Jesus. Ottawa: Age of Reason. Posted on 2018-12-28 03:30:41 GMT+0000 by Neil Godfrey. This entry was posted in Christian Origins and tagged Doherty: Jesus God nor Man, Epistle to the Galatians, Simon Gathercole. Bookmark the permalink. I don’t think its an interpolation. I agree with Carrier’s assessment that the woman is simply allegorical. She is a heavenly woman and the passage is describing a heavenly birth. I think that’s right, but how do you actually know what these ancient thinkers had in mind? They had a fundamentally different view of the world than we do. I disagree. I’m an atheist from taking G.A Wells’ advice and reading just Paul while remembering the Gospels, and hence the plot, were not yet written. I was thirteen or so and hardly wide read in the New Testament or it’s study. Granted I kept an open mind for twenty years or so on historicity myself but even so I didn’t think it very likely, i.e. odds greater than the 12000 to 1 odds against of Richard Carrier, Paul or the other Apostles he wrote of ever thought Jesus other than a cosmic being. What about 1 Cor 15:20, “Now Christ has been raised from the dead…”? Doesn’t that complicated the theory that the saving activity was not recent? Was the raising from the dead through the Discovery in the Scriptures of the long hidden mysteries? Raising from the dead was part of the hidden mysteries. The primary (“super”) mystery appears to be that celestial Jesus would deign to possess a human body and be humble enough to undergo death-&-stauros thus doing his duty as the “Lord of Glory”, whereas Satan had failed to do his duty. Such questions need to be addressed in their Greek text and context of the Greek text, not any particular English translation. Could this woman be connected to Paul’s discussion following from Gal. 4:22 ? Jerusalem above, an allegory who ‘is free, and she is our mother’. Which could make Hagar the allegorical mother of Jesus ? If Paul meant the same type of birth for Christ in 4:4 why did he change verbs here? I can imagine Paul’s reference to “born of a woman”, “born under the law” as one thing prompting the author of “Mark” to write his allegory-like Gospel. Is it not possible that the son sent by God, born of woman under the law, was Israel? Witherington, Ben (20 September 2009). “Christology – Paul’s christology”. In Gerald F. Hawthorne. Dictionary of Paul and His Letters: A Compendium of Contemporary Biblical Scholarship. Ralph P. Martin; Daniel G. Reid. InterVarsity Press. ISBN 978-0-8308-7491-0. There were different Jewish interpretations of the Servant of Isaiah along the same lines: some finding reasons to interpret the Servant as Israel as a whole, and others drawing attention to passages that indicated a single individual. The “one like the Son of Man” in Daniel has also had similar divergent interpretations.